Past Summer Honors Institute participants on campus. 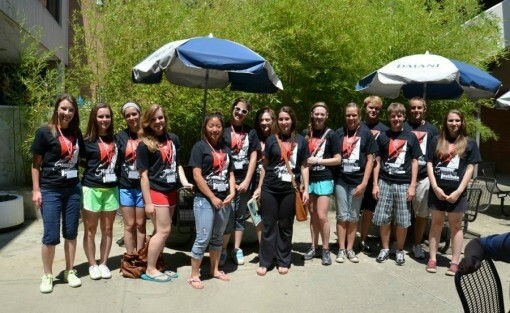 Eighty-five gifted high school students will participate in a variety of courses and hands-on activities this week at the 2015 Summer Honors Institute on the campus of Youngstown State University. The Institute runs from June 15 to 19. Participants spend Monday through Thursday immersed in classes in a wide range of disciplines taught by YSU professors and area experts. Course topics include: Entrepreneurship, Law, Documentary Filmmaking, Crime Scene Analysis, Rapid Prototyping, Technology and Healthcare in the 21st Century. Among new classes this year are iPhone Photography, Rockets in Flight, Economics, Mathematical Modeling and Social Media Campaigns. Students conclude the week on Friday with learning activities in the morning, a YSU Informational Fair to learn about majors and campus services, and an afternoon celebration and demonstration of what they have learned in their courses. YSU President Jim Tressel will join parents and special guests for the afternoon celebration in the Chestnut Room of Kilcawley Center. In addition to daily activities, 15 students will also extend their learning in the residential program, where they will live on campus in Cafaro House for the week. These residential participants have the opportunity to engage in a service project, develop leadership skills, discover the hidden gems of Youngstown and build new relationships among their peers. This is the third year for the residential option, and this summer’s participants include students from Florida and Washington. Next year’s program is scheduled for June 12 to 17, 2016. Applicants must be formally identified as gifted and talented or meet the entrance requirements of the YSU Honors College and be a sophomore or junior in high school during the 2015-16 academic year. For more information about the YSU Summer Honors Institute, contact Institute Director Amy Cossentino at alcossentino@ysu.edu or Sharyn Fees, program assistant, at sefees@ysu.edu.